President Barack Obama, first lady Michelle Obama, former President George W. Bush and former first lady Laura Bush, and U.S. Rep. John Lewis (D-Ga.), one of the original marchers, lead a walk across the Edmund Pettus Bridge to mark the 50th anniversary of the Selma-to-Montgomery, Ala., civil rights marches in Selma March 7, 2015. The world saw a magnificent celebration last weekend in Selma, Ala., of the 50th anniversary of the Selma-to-Montgomery marches. The racially mixed crowds were huge, exciting and orderly. More than 120,000 attended the two days of commemorative events. Foot soldiers mingled with dignitaries from the public and private sectors. President Barack Obama gave one of the most brilliant speeches I have ever heard. More than 100 members of Congress joined him in Selma. Alabama Gov. Robert Bentley attended the ceremonies, along with scores of state and local officials. A host of corporate sponsors toasted this splendid occasion under VIP tents that were erected for the privacy and convenience of privileged guests. The theatrics and photo opportunities knew no bounds. The cinematography was simply breathtaking. It was a made-for-TV event. All of the celebrities and visitors are gone now. The celebrations are over. The tents have been taken down. Selma is back to normal. It is once again a city in a permanent state of distress. It is poor, black and neglected. Selma, the birthplace of the Voting Rights Act, had a bright moment in the sun for two days last weekend, but now that moment has faded. To my amazement, not one federal, state or local public official came to Selma to honor the courage of the 1965 marchers in a tangible way. Not one of them, from Obama on down, brought a single dollar of urban-revitalization capital, economic-empowerment grants, job-training funds or educational-enhancement money to Selma. This would have been a wonderful way to say “Thank you” to Selma for changing America for the better. I have watched over the years as America has sent hundreds of billions of dollars in aid to places like Afghanistan, Iraq and Pakistan. America has justified the expenditure of these vast sums of taxpayer dollars by claiming that we are supporting nation building and democracy in these countries. Selma represented a defining moment in American’s 20th-century democracy. The blood that was shed in the city gave millions of African Americans the right to vote. This single event literally reshaped America’s political landscape. It would have been easy for Obama or the members of Congress to preserve the city’s legacy as the cornerstone of American democracy by bringing a check for $200 million to $300 million, made out to the city of Selma. An announcement to this effect on the 50th anniversary of “Bloody Sunday” would have signaled to the world that America values its African-American citizens and their contributions to building a greater America. Frankly, I do not need to hear another speech honoring the bravery of our 1950s, ’60s and 70s civil rights heroes. We already know they are heroes. They did not risk their lives for mere recognition at commemorative events. They did it so that blacks could take their rightful place in American society. They were fighting and dying so that blacks could secure equal justice in all aspects of American life. We must honor these heroes the right way. Our federal and state governments must reinvest in America’s deteriorating inner cities and communities. We must support urban revitalization and economic empowerment in Selma (and countless cities like her) with the same vigor with which we have supported it in places overseas. 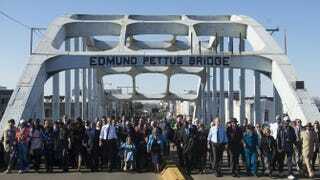 Marching over the Edmund Pettus Bridge last weekend was purely symbolic and all too easy. There are no more violent confrontations with state troopers at the foot of the bridge. Those days are gone, forever. The fight for our urban areas and quality education in America’s inner cities is the new front line of the battle for equal justice. Our political leaders need to show us some courage by awarding these cities enough funding to make a difference. Selma and her sister cities are crying out for their fair share of tangible economic support, and it’s time for our public officials to acknowledge how valuable these cities are to America’s growth and progress. Donald V. Watkins is a Birmingham, Ala.-based lawyer and international entrepreneur with business interests in banking, petroleum exploration and waste-derived fuels. He publishes weekly commentaries on his Facebook page.